Size:2 PACKS Features: Dual-Band Display, Dual Freq. 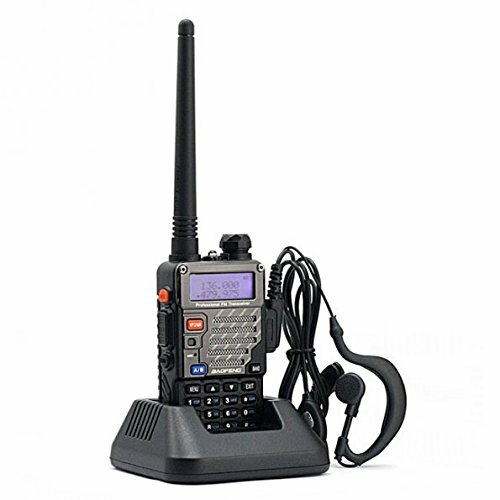 Display, Dual-StandbyOutput Power: 4 /1 Watts 128 Channels 50 CTCSS and 104 DCS Built-in VOXFunction 1750 Hz Burst Tone FM Radio (65.0MHz - 108.0MHz) LED Flashlight LargeLCD Display High /Low RF Power Switchable 25 KHz/12.5KHz Switchable EmergencyAlert Low Battery Alert Battery Saver Time-out Timer Keypad Lock MonitorChannel Step: 2.5/5/6.25/10/12.5/25 KHz ROGER SET General Specifications.Frequency Range: 65-108 MHz (FM Receive only); 136-174 MHz and 400-479.995MHz(TX/RX) .Channel No. : 128 .Frequency Stability: +/- 2.5ppm .Antenna: Highgain Dual-Band Antenna .Antenna Impedance: 50 ohm .Operating Voltage: DC 7.4V.Mode of operation: Simple or semi-duplex .Dimension (W x H x D): 100 x 52 x32 mm .Weight: 250g (including battery, antenna) Transmitter Specifications.Output power: 4W / 1W (Max 5W) .Modulation Mode: 16kWbF3E / 11kWbF3E .Maximumdeviation: <5kHz(Wide) / .Pre-emphasis characteristics: 6dB .Current:<=1.6A(5W) .CTCSS/DCS deviation: 0.5 +/- 0.1kHz(Wide) / 0.3 +/- 0.1kHz(Narrow).Intermediation sensitivity: 8-12mv .Intermediation distortion: <10 PackageContents: 2 x UV-5R Plus; 2 x 7.4V 1800 mAh Li-ion Battery Pack; 2 x Antenna136-174/400-479.995 Mhz; 2 x Earphone Mic/Headset; 2 x Belt Clip; 2 x HandStrap; 2 x ENG / GER / FRA Manual; 2 x Adapter; 2 x Desktop Charger.